David Byrne has gone from writing charmingly goofy lyrics while fronting for Talking Heads, the art-school punk band he cofounded in the 1970's, to a polymathic avant-gardist involved in movie directing, art installations, photography, collaborations with Twyla Tharp, and now a prose stylist with Bicycle Diaries. Appropriate since "prose" is also the past participle of the Latin verb "provertere," having moved forward. Which Byrne does on his Montague folding bike across the United States and in Berlin, Istanbul, Buenos Aires, Manila, Sydney, and London in this charming cycling chronicle with aside musings on topics such as the nature of beauty, women as billboards, ugly buildings, and, of course, music. Byrne's a good traveling companion. You get the impression he knows Johannesburg as well as he knows Joplin (the town, not the late singer), seen that in Romania hitchhikers use the forefinger rather than thumb, shivered in Mongolia's Ulan Bator, the coldest capital city on earth, yet he also maintains the rube's sense of amaze at cities. And I can concur that there's no better way to learn a place than atop a bike pedaling rather slowly, to use an expression from Dr. Johnson's dictionary, at an "egg- wife-trot". 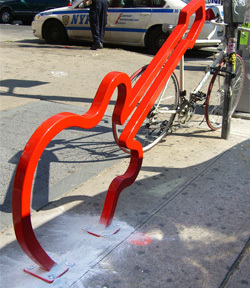 Bike rack designed by David Byrne for New York City. Although having biked for over 30 years, Byrne's cycle diaries only cover the last dozen years, each chapter focusing on a city, then ending with an epilogue ("The Future of Getting Around") that includes his clever designs for New York City bike racks: a dollar-shape for Wall Street, the outline of a whiskey bottle for the Bowery, a circled-globe for the American Museum of Natural History's Planetarium. … In Millvale, near Pittsburgh, Byrne finds remarkable anti-war murals by Maxo Vanka in St. Nicholas Croatian Church, the first Croatian Catholic diocese in the U. S.
… In flat Berlin, a sterling cycle city, the bike paths have stoplights and turn signals. … Manila's Binondo area blares with karaoke machines on the streets, perhaps a reason Byrne flees north to the village of Batac where Ferdinand Marcos lies in state in a refrigerated glass casket, a la Lenin, bathed in eerie blue light. … In Buenos Aires, Byrne — no surprise — finds lots of music, even bachata bands from Santo Domingo, but no mention of Argentina's 24-hour FM Tango radio station. He visits neighborhoods, but we don't learn if cycling's safe on Avenida Nueve de Julio, the world's widest major street, or Avenida de Santa Fe, B.A. 's most elegant thoroughfare. … Safest bike paths? In Copenhagen, Berlin, Amsterdam, and the path in Italy's northern city, Reggio Emilia . All this two-wheeled travel Byrne describes in thoughtful, amiable prose, which like a cash gift, is always appropriate. Only a diatribe or two aimed at "international style" detritus architecture, and "landscaped industrial parks and weird nonspaces that evoke nostalgia for the nonexistent." Indeed. If reading Bicycle Diaries jump-starts your cycling enthusiasm while traveling, RentaBikeNow.com offers selections of bikes, from cruisers to carbon-fiber racing bikes, through local cycle shops in major American cities. Bicycle Diaries. 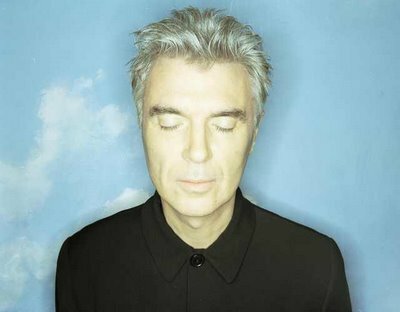 David Byrne (Viking, 2009, $25.95). at Texas Monthly before moving to New York to write for New York and Newsweek.